What types of contamination were found in the neighborhood and where did they come from? How do I know if there is contamination on my property? What is the Department of Energy and Environmental Protection's role in the clean-up? What are the possible health effects of the contamination in the Newhall neighborhood? Is my water safe to drink and use? Is it safe to garden and dig in the yard? Are the former school fields safe to play on? When will we be able to use Rochford Field and Peter Villano Park? When will the cleaning up of the former Hamden Middle School property start? Why is the Newhall neighborhood a “Local Design District”? 1. What types of contamination were found in the neighborhood and where did they come from? 2. Where was contamination located? 18 Blocks of mostly residential properties: Extensive areas of waste fill extending to depths of more than 15 feet have been found in the Bryden Terrace area west of Wadsworth Street; along the east side of Newhall Street between and Goodrich Street, along the west side of Newhall Street between Augur, Remington, and Harris Streets; and between St. Mary Street, Edwards Street, Shelton Avenue and Butler Street. In addition, isolated areas of shallow fill (generally no more than 4 feet deep) have been found in other blocks. (see map) Some of this fill was present at the ground surface, but emergency measures were taken to either remove the shallow soil or cover it with woodchips to protect people until the final cleanup can occur. The Former Hamden Middle School Property and portions of the former Newhall Community Center Property (future Hamden Business Incubator) : An extensive area of waste fill up to 25 feet deep occupies most of the former middle school property. Rochford Field and Peter Villano Park, and the Winchester Avenue Sewage Pump Station: Waste fill up to 12 feet in depth covers most of these Town parks, and likely underlies the pump station. Based on testing results a cleanup plan was developed and approved by DEP in 2007. Remediation of residential properties began in 2010 and was completed in 2012. 3. How do I know if there is contamination on my property? Extensive testing was done in the Newhall neighborhood. The results are listed on pages 33-40 of the Department of Environmental Protection’s Remedy Selection Plan. Each property in the Newhall Remediation Site is listed by street address and it will say how much (if any) waste fill was found on the property. Between 2010 and 2012 all contamination was removed from residential properties down to a depth of four feet. Waste fill below four feet was covered with a marker barrier fabric. The deep waste fill remains in place as it does not pose a hazard to human health. 4. Who is responsible for the cleanup? Town of Hamden: Responsible for testing and cleaning up Rochford Field, Peter Villano Park, and the sewer pump station. DEEP helped the Town obtain state funding to clean up Rochford Field. Cleanup and restoration of Peter Villano Park will be paid for by the Town of Hamden. 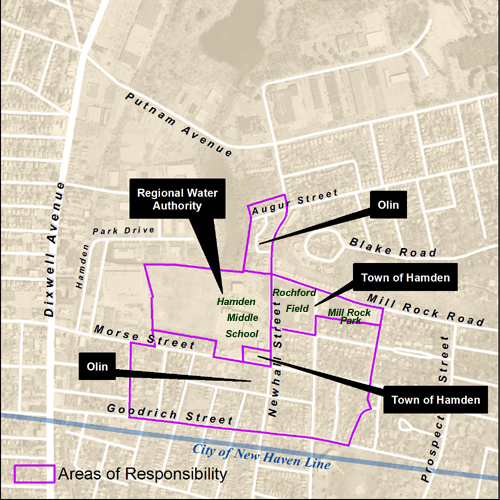 Regional Water Authority: Responsible for testing and cleaning up the former Hamden Middle School, part of the Hamden Community Center, and two adjacent residential properties. These are properties that the old New Haven Water Company used to own. Olin Corporation: Responsible for testing in the non-public properties (mainly residential) area surrounding the Middle School and parks. Olin and DEEP shared the cost of the cleanup in these areas. This portion of the cleanup project was completed by the end of 2012. 5. What is the Department of Energy and Environmental Protection's role in the clean-up? 6. What are the possible health effects of the contamination in the Newhall neighborhood? 7. Is my water safe to drink and use? 8. Is it safe to garden and dig in the yard? Yes. All contamination was removed to a depth of 4 feet. Normal gardening activities and tree planting does not reach below 4 feet. 9. Are the former school fields safe to play on? 10. When will we be able to use Rochford Field and Peter Villano Park? The cleanup of the two parks will be completed by late spring/early summer 2015. Hardscape surfaces such as tennis and basketball courts and play equipment will be opened in the fall 2015. Grassy areas and ball fields will not be available for play until spring 2016 to allow newly seeded grass to take root before being put into heavy athletic use. 11. When will the cleaning up of the former Hamden Middle School property start? 12. Why is the Newhall neighborhood a “Local Design District”? 13. Who can I contact if I have more questions?